Tags: Brother, Brother tape, label tape . Extensive testing has been performed to ensure that P-touch TZ labels are incredibly durable under all kinds of conditions. They hold up extraordinarily well - and stay crisp, legible and affixed - even when subjected to abrasion, extreme temperature, industrial chemicals and sunlight. Brother's patented tape technology ensures that Brother P-touch laminated labels can withstand even heavy abrasion. Whether you want to use the labels in freezing conditions or extremely warm environments, Brother P-touch laminated labels have been designed to last. Wherever you use P-touch laminated labels, they will stay as clear and legible as the day they were applied. Testing TZ labels 'to the extreme' has found them to be waterproof and resistant to chemical spill. 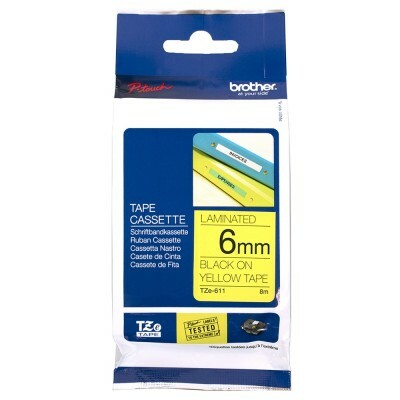 Brother M821 Black On Metallic Gold P-touch Label Maker Tape, 3/8 In. X 26.2 Ft. This non-laminated tape comes with standard strength adhesive and is .. Product DetailsBrother Lift-off correction typewriter tape in black color is designed to use with EM530, EM630, ML100, ML300 and SX4000 model.For use..
OverviewThe PT-E500 industrial handheld labeling tool kit comes with design software to help integrate into work flow processes. Design and print labe..
Main Features	Compact and lightweight	Perfect for desktop or on-the-go use	Flexible scanning sizes	A variety of media types including documents, busi..